BOTOX ® Cosmetic is administered by a healthcare professional as a simple, nonsurgical treatment that is injected directly into the muscles between the brows. It works by blocking nerve impulses to the injected muscles. This reduces muscle activity that causes moderate to severe lines to form between the brows. Botox® Cosmetic is a prescription cosmetic product that is used to eliminate lines and wrinkles on the face caused by every day facial expressions and muscle movements. Generically, Botox is botulinum toxin type A, and it is one form of botulinum toxins, which are a group of chemicals that can paralyze muscles. Botox Cosmetic was approved in 2002 to improve the look of fine lines and superficial wrinkles caused from every day facial expressions like smiling, frowning, or squinting. A tiny injection of Botox into the facial muscle causing the line or wrinkle stops the muscle from moving and prevents the wrinkling. The most common areas to be treated with Botox are the forehead, the area between your eyebrows at the top of your nose (the glabella), and the outer eye area. 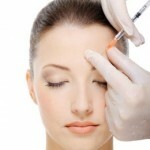 Botox is injected with a very fine needle into the muscle or muscles that are causing the wrinkle or furrow. Usually, you get several injections in each muscle. It may take about 30 minutes or so to complete the whole treatment.